The versatile Vox Soundbox Mini was a portable two channel amplifier that was capable of either AC or battery operation. It could function as an guitar, bass or keyboard amplifier, media player or as a self powered "mike stand monitor." 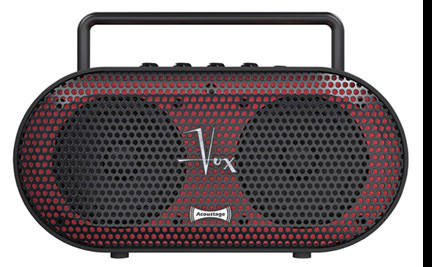 The Soundbox Mini weighed less than six pounds and featured two 4" speakers. It produced 5 watts in mono or 2.5 watts per channel in stereo. The obround aluminum case of the Soundbox Mini featured a bar style handle and a ¼"-20 threaded insert to mount the unit on a mike stand. The Soundbox Mini featured three ¼" input jacks. Two of these jacks were in the "GUITAR" channel, the third was in the "MIC" channel. Separate level and FX controls were provided for each channel. The "INST" selector was adjacent to the dual ¼" "GUITAR" inputs on the control panel. It toggled between eleven unique instrument models. Depending on the setting, this control tonally optimized the "GUITAR" inputs of the Soundbox Mini for electric guitar, acoustic guitar, bass guitar or even keyboards. While the electric guitar, acoustic guitar and bass guitar models were mono, the keyboard models were stereo. The multi-function "LOW [GAIN]" control adjusted input gain sensitivity unless the "INST" selector was set to "Keyboard." In "Keyboard" mode, this control adjusted bass response. The "HIGH [TONE]" control rolled off the treble response of all instrument models. The Soundbox Mini also included a variety of digital effects including Compressor, Chorus, Flange, Tremolo, Delay and Reverb. These were adjusted by the "FX1" and "FX2" controls. The Soundbox Mini also included an mp3 input with a "center cancel" function. When engaged, the "center cancel" function could eliminate sounds in the center of the mix, such as the lead vocal. The mp3 input also included Korg's "Acoustage" effect, a surround sound simulator. The Soundbox Mini also features a single note, digitally controlled "E" tuner for guitar or bass. 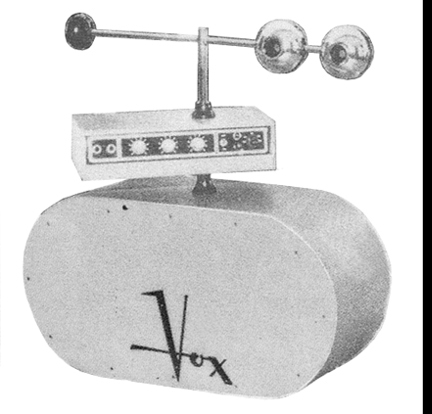 The Soundbox Mini's obround case and stylized Vox logo were inspired by the Super Transonic 60, a bizarre and short lived amp model introduced by Vox in 1963 (see photo at left).